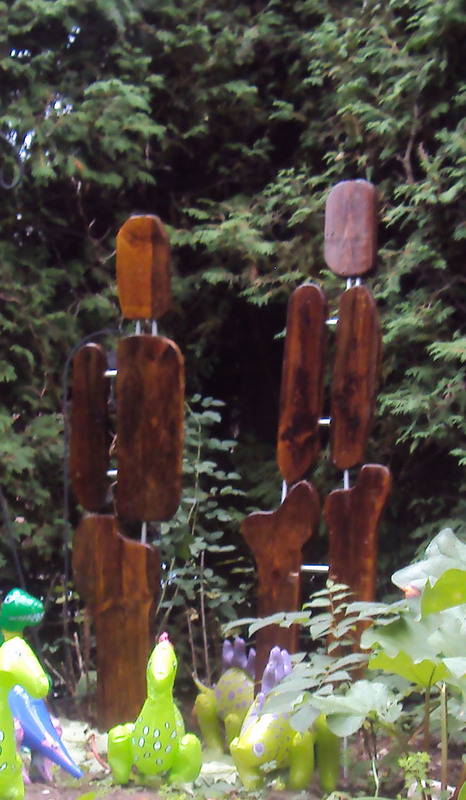 Our garden is watched over by the “Travellers”; sculptures created by my husband. To me they are organic and harmonious, a peaceful addition to the landscape. This is the challenge isn’t it? How to stay upbeat when you just feel like crap. I’ve watched my husband over the last two weeks get leveled by chemo, a blood clot, thrush, headaches, and nausea. The side effects of the disease and the treatment are debilitating. We know that success in battling cancer depends on the psychological state of the individual – which speaks volumes to those survivors since both the disease and treatment drag you down. Ultimately it comes down to small time pain and hardship for long term gain. That’s the prize isn’t it – long term gain. The present setbacks have to be put into perspective as temporary with the goal firmly ahead of getting past them and into a state of harmony and health. It’s finding a strategy or a method that works for the individual to keep them looking forward. For us our strategy is keeping focused on near future events. Like an Art Show in October that he’d like to put a picture in. Like having the family home for Christmas and enjoying just being together. Like a new grand baby due in February. These things keep us going, keep him emotionally grounded, and provide a reason for going through all that he is going through. It helps to have a strong support network too and in that way we are very fortunate. Wherever this journey may take us we know that we have a web of family and friends gently behind us to catch us if we falter. Thank you all.